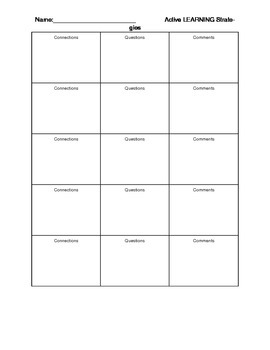 I use this graphic organizer with my fifth grade students to help control the blurts. Each child gets a page that is double-sided with the chart. I tell them to write down any connections, comments, or questions they have that they are not able to share during class time. When they think about these things during a discussion, they are actively learning, even if they are unable to share their thoughts. The students hold on to these and use them daily in every subject. When they charts are full, no matter how long it takes, they can come to you for a new one. They are never "done" learning, so they are never "done" using the organizer. I give them a small reward for a completed one and then a fresh page with two more.